Note: Two days after publishing this blog post, my husband had a stroke. I am so grateful it wasn't worse than it was and he is recuperating wonderfully well. I am feeling so very grateful for the beauty of Spring flowers, the sound of early morning bird song, the playful antics of dozens of little squirrels as they perform their high wire acts from limb to limb. I am grateful for the budding of new leaves on trees, the buzzing of bees, and the sweet hum of humming birds as they flit back and forth from our many feeders to fresh blooms in the yard. Grateful that my youngest sister-in-law, Shelley, with advanced cancer is holding her own, after her 7th chemotherapy treatment. She and my brother fly from Juneau to Seattle every three weeks for another round of treatment, so while it might seem discouraging that they she is now on 'maintenance' levels, that is actually a good thing. She is holding her own and still striving to live until her second grandchild is born in May. Grateful that my brother in Eagle River who battles one round of pneumonia, and one medically induced coma after another, is now feeling well enough to have some physical therapy to get his strength back. And his wife, with end-stage kidney disease, who crashed and burned with severe high blood pressure and fluid filled lungs, is now back to holding her own against the increasing odds of finally being "sick enough" to make her way up on the kidney transplant list. Life if filled with so many challenges, but we focus on the good, the daily gratitudes of health, happiness, and the ability to bear whatever pains we might feel that day. As someone who was told in 1981 to prepare myself for a life in a wheelchair, I know better than anyone that doctors can be proved wrong, time is fluid, and so are all of our choices. You just take it day by day, week by week, year by year with gratitude for what one has that is good and filled with meaning. For everything that is taken away or given up, so much more is given that others do not have nor will ever be able to experience. Such simple little flags, but made with love and intention. Light enough to still flutter in the winds of time and spread their message of gratitude and love everywhere. It feels so good to be outside and working in the yard, seeing all of the new growth, and delighting in those little blossoms brave enough to face the possibility of late frost. We lost so many rhododendron, hydrangea, and peonies in our suddenly severe winter, but have the blessings of 5 new peonies hand delivered by the grateful owners of Pookie, the precious little dog who got lost during the fire works of New Years Eve in Brooks, Oregon and somehow found his way over farmland to our home in Salem. It was a miracle he survived the more than 5 mile journey and a blessing that he found us as we never gave up trying to locate his owners without benefit of a tag or identification of any kind. Now, we hear that sweet little Pookie has a new collar with tags securely attached, but also a microchip, as well. And his young college age owner was so grateful she made her parents promise to get these peonies to us, before spring for planting! So, her wonderful parents, who just happened to own Brooks Garden came by with a fabulous gift of five lovely peonies ....and they didn't even know that we had lost ours in the severe winter freeze! Oh, I do so love peonies..one of my favorite of all, flowers! And don't miss this...a wonderful opportunity for a rare event a total lunar eclipse which turns the moon a rusty red. Known as the Blood Moon the sunlight will stream around the Earth and throws the moon into Earth's shadow. 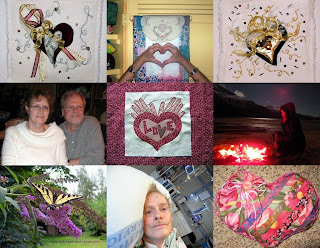 Shown, above #15,000 - And The Greatest Of These Is Love (sold for $105.00) : One of my 75 small format art quilts donated to the Alzheimer’s Art Quilt Initiative (2007-2013). And last, but never, ever least....I am so very and truthfully, grateful for all of you. Nearing almost 6 million views now, I wonder "how in the world did my love of writing and sharing lead to me being a blogger? But again, the Universe had a different plan in store for me, and I just do my best to oblige in any way that I can. So, thank you, those who comment and those who do not..I am still grateful! Such a lovely way to remember to be grateful, to create blessings, and share with others. Wow, what a great gift of plants for you. Hope you enjoy your spring; I love your blog and seeing your creative spirit in action. Blessings to you Michele. Such a life and you stay happy. Glad I came here today. I think I needed this reminder. Gosh, I haven't read blogs in a while. I'm sorry to hear of so many things happening again in your family. Sending up prayers. Hi Michele. Just wanted you to know that even though I don't always leave a comment, I do read and love your blog. You are such a wonderful inspiration to me. Every time I read your blog, I feel so much better for having done so. My family has had a lot of ups and downs,too, but I know that there are others that have it harder than us. I am so thankful we have a Heavenly Father that loves us and helps us make it through the hard times. Thank you for all you do and God Bless. Love Brooks Gardens. I live in Salem, and have gone there to get peonies on Memorial Day. A person certainly needs to learn to count their blessings, even in the midst of trouble. I've done that in my life. Another wonderful post Michele! Thank you for sharing and reminding us that even when faced with challenges there is still beauty in the world and there is much to appreciate.